We have been in Florida since 1987, but our practice is much older than that. Hollstrom Chiropractic Clinic began in Cheboygan Michigan in 1951. It was started by Vernon Hollstrom, DC. He practiced there until 1967. He instilled in his children a love for the chiropractic science and art and all four of his children became Chiropractic Physicians. 300 hour Continuing Education Courses in Advanced Pharmacology, Internal Medicine, and Family Practice. Impairment Rating and Disability Rating. Board of Trustees, National University of Health Sciences (now affiliated with St. Petersburg College as well as the Lombard, IL campus). Expert Witness, State of Florida, Department of Legal Affairs, DOH. Former Expert Advisor for State of Florida Workers Compensation System. Dr. Gregory Hollstrom II has the distinction of being a third generation chiropractic physician as the son of Dr. Hollstrom and Grandson of Dr. Vernon Hollstrom. Undergraduate Education: Lyman Briggs College, Michigan State University. Doctor of Chiropractic Degree, 1992, National University of Health Sciences. Board Certified, American Board of Chiropractic Neurology. Certified by Cox™ Institute in Distraction-Axial Decompression. Continuing Education in Orthopedics, Neurology, Radiology. Completed training in Impairment and Disability Rating. 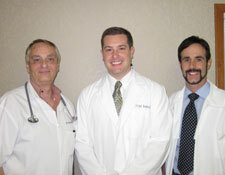 Dr. Brian Rebori joined our clinic practice in 2008, after working in a group practice in Largo. Associate of Arts Degree and Bachelor's of Professional Studies Degree with concentrations in Life Sciences. Doctor of Chiropractic Medicine degree from New York Chiropractic College in 2005. Internships in Seneca Falls and Levittown New York Student Health Centers, and the Salvation Army Clinic in Freeport, NY. He additionally did rotations at the Central Nassau Guidance and Counseling Services in Bethpage NY and at the State University of New York at Farmingdale at the College Infirmary. Certified in Cox™ Axial Decompression. Hollstrom & Associates Inc, (727) 393-6100, frontdesk@drgreghollstrom.com | Base Content Copyright © 2019 Market Hardware, Inc.